According to a report from Spanish media outlet AS, Raphael Varane is considering leaving Real Madrid because the club chose not to pay tribute to his role in France's World Cup win last year. Raphael Varane has spent the most part in his career with the Spanish giants. The French center back has been featuring for Los Blancos for eight seasons after he came into the club when he was just 18 years old. It goes without saying that Varane has played a pivotal role in the success of Real Madrid since his arrival. The 25-year-old star defender's impact was immeasurable when Los Blancos won the Champions League four times in five years. Varane also showed his caliber as France went on to lift the World Cup in 2018, defeating Luka Modric-led Croatia in the Finals. There is little doubt over the fact that Varane played a major role in France's rearguard and was one of the best defenders in the tournament. Varane will turn 26 this April and still has three years left on his contract. French paper, L'Equipe claimed that the Frenchman will be heading to the exit door in the coming summer window. According to the report, the French defender is unhappy with the club management since the start of 2018/19 season. Real Madrid board failed to pay tribute to the center-back's heroics after the World Cup, unlike Spanish giants Atletico Madrid and Barcelona. Both Athletico Madrid and Barcelona gave their stars like Antoine Griezmann, Samuel Umtiti and Ousmane Dembele to show their medals in the Wanda Metropolitano and Camp Nou respectively. 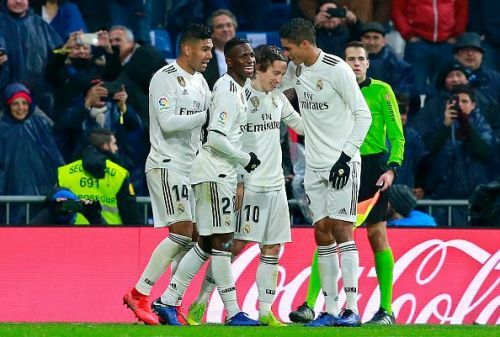 But Los Blancos board failed to show such respect to Varane out of respect for Luka Modric, which is why the French defender is considering his exit from the Spanish capital after such a long time with the club.